My new house in Pembroke has two bathrooms with one on the main floor and one in the basement. We were mainly using the bathroom on the main floor because, well, the downstair’s toilet isn’t the easiest to flush. It’s not that the toilet is broken. It still works, but it’s what is called a low flow toilet meaning it uses significantly less water than a full flush toilet. You can flush and the toilet paper will not go down on the first try. Sometimes you need to flush a couple times for it to work. That kind of defeats the purpose of a low flush toilet: to save on water. That’s the main reason why we never used the basement bathroom…until recently. I’ve been using MAJESTA e•z flush toilet paper down there and it’s like it was made for this toilet. It actually flushes down, even if you use a lot of toilet paper which I tend to do. 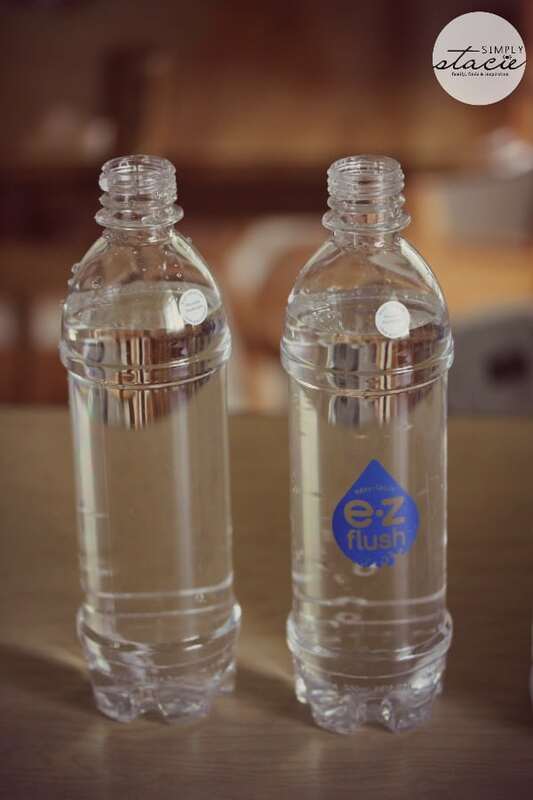 MAJESTA e•z flush was designed for low flow and dual flush systems. This is the toilet paper you need to buy to bring with you to the cottage, your RV or if your home is on septic system. Or if you just have a stubborn toilet like me. 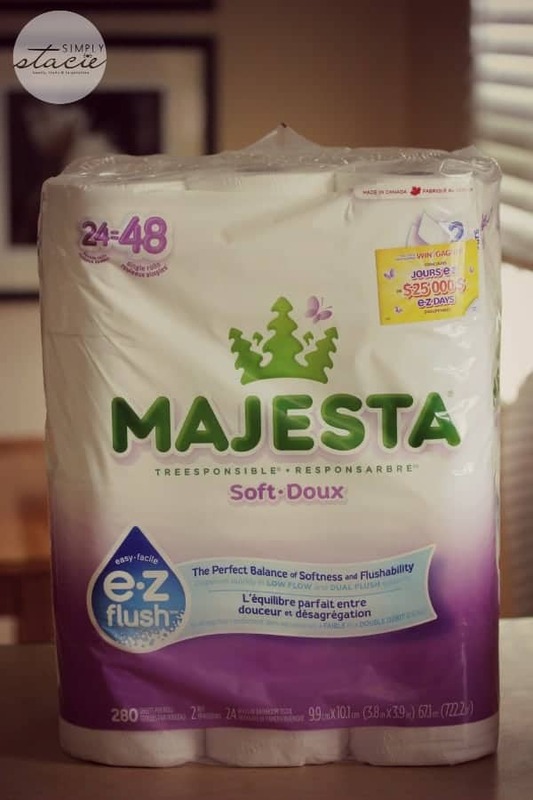 As Canada’s leading performance manufacturer of low flow and dual flush systems, MAJESTA e•z flush is what you need to try. I’m picky with my toilet paper and don’t like to use anything rough. MAJESTA e•z flush is also soft too. It’s the best of both worlds- softness + flushability. 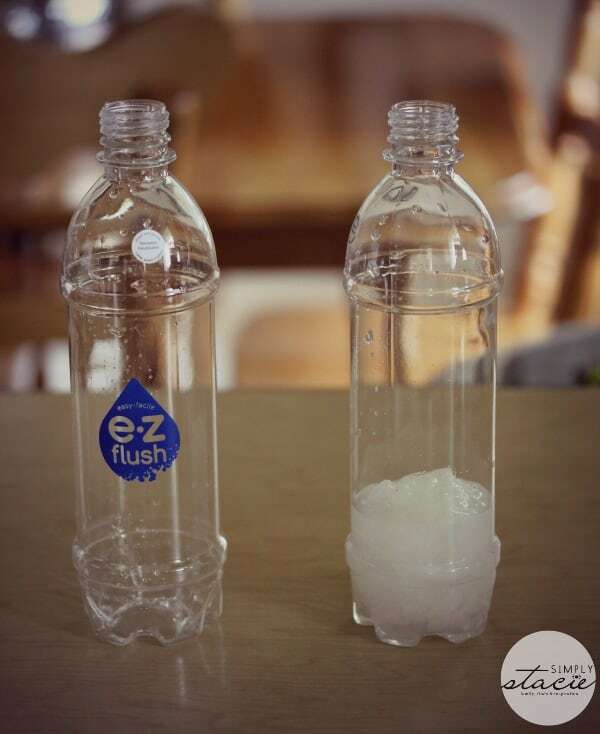 I’m excited to share with you the results of the MAJESTA e•z flush shake test I recently did at home. 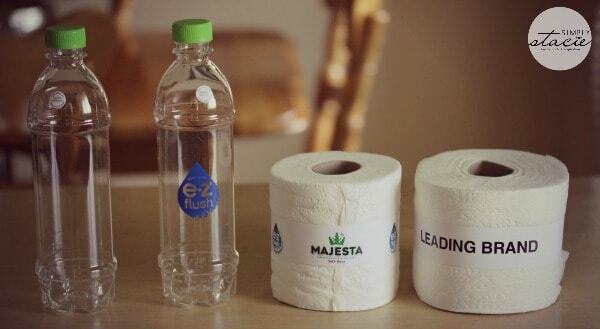 I witnessed firsthand what happens when MAJESTA e•z flush toilet paper and a leading competitor brand hits the water. The results were pretty neat and very telling! Feel free to duplicate this test at home. All you’ll need is two empty water bottles, a roll of MAJESTA e•z flush and another brand of toilet paper and some water. Step One: Fill up each water bottle with water. Step Two: Grab a wad of toilet paper from each of the rolls. Step Three: Push each wad of toilet into the water bottle. My daughter, Bridget, was assisting me with the test. 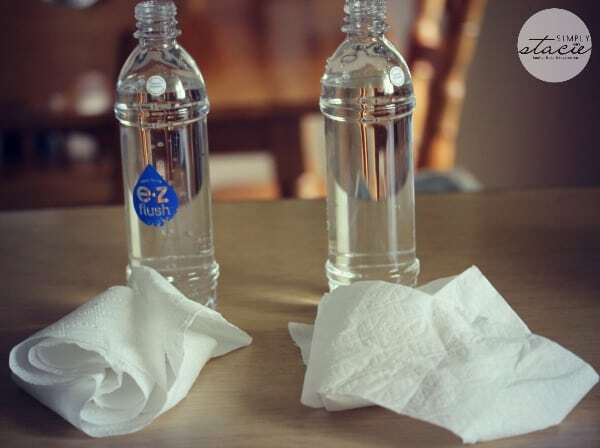 Step Four: Place the cap on the water bottles and give them a good shake. Bridget shook one while I shook the other. 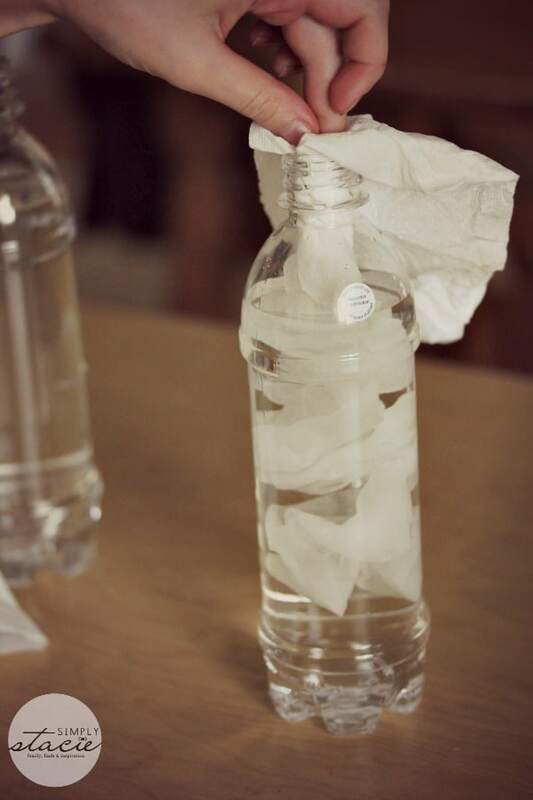 Step Five: Pour out the contents of both water bottles and see what is left inside. 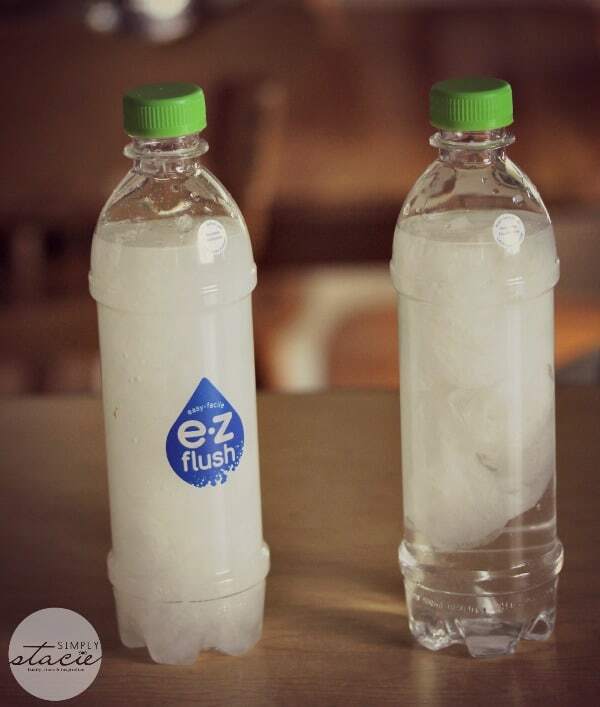 As you can see from the test, the water bottle with the MAJESTA e•z flush is completely empty. It quickly broke down in the water and was easy to pour out into the sink. The competitor brand would not fully drain and still has toilet paper left in the bottle. Now I know why it works so well in the basement toilet! Do you know how to fix toilet troubles? I know how to work a plunger, but that’s about it. Tammy Buchanan, a plumber and founder of Small Jobs Plumbing, is the first female owned and operated plumbing company in Nova Scotia. She’s also mom to an eight-year-old boy and knows her way around a toilet! One of her top tips for avoiding plumbing issues is to use a a toilet paper that breaks down quickly in the water. It’s especially important to follow her advice if you have a low flow toilet, septic system, cottage or RV or have a member of your household who uses just a little too much toilet paper. Eek I’m guilty of that! She shares some tips on how to fix common toilet problems in her e•z Toilet Fixes videos on Majesta.com. Ever wonder how to change a toilet flapper? Tammy will show you how to do that and more. She makes it look so easy. We had 4 floods *septic* in one year. The pipes were broken under the house and all the waste kept catching and it would back flow into our basement. Thankfully the landlord finally fixed it.. what a mess!! Luckily our toilet hasn’t had any major issues with getting clogged or leaking but we did have to have to flusher replaced recently. Energy conscious family – so when a plumbing contractor advised that we should replace our old toilet with a new one – water level in the bowl was 1/2 from the former and flushing seemed adequate. At times when the toilet paper bunched up – issue – had to flush three times to eliminate waste – not sure if we are saving or not…H20 bill this month will tell. We got all plugged up in the sewer line by using 3 ply super cushy toilet paper. Have switched to Majesta ever since. With a little one we have had a few times where too much toilet paper has been used and it plugs things up. I did at my old residence ..not in about 5 years now.